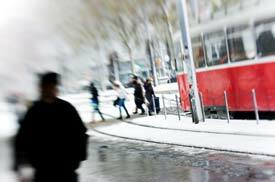 PHOTO: A Vienna tram on a snowy winter day. 100+ illustrated travel features on Austria and Switzerland, arranged by category. Photo copyright © Karina Tischlinger.